According to his military service records, Jesse C. Kimball was a 31 year old "Tin Smith" residing at Princeton in Gibson County, Indiana when he enlisted on August 11, 1862 into what became Company A of the 80th Indiana. Jesse was mustered into the Union Army at the rank of 1st Sergt. for a 3 year term of service on September 4, 1862 at Camp Gibson near Princeton, Indiana. At that time he was recorded as having been born in "Posey Co. Ind." and being "5 feet 7 1/2 inches" tall, with "grey" eyes, "light" colored hair and a "fair" complexion. One day later Sergt. Kimball was commissioned by Indiana Governor Oliver P. Morton as the new 1st Lieutenant of Co. A. This made him second in command of the company, just above 2nd Lieut. William M. Duncan and just below Capt. Charles G. Brownlee (its commanding officer). All three were new to their ranks and positions. Lieut. 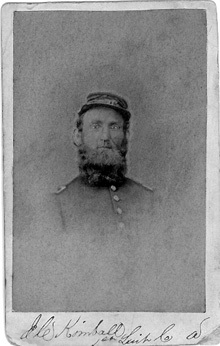 Kimball filled the vacancy created when 1st Lieut. William P. Welborn was promoted to be the 80th's Assistant Surgeon, and Lieut. Duncan filled the vacancy created when 2nd Lieut. Brownlee was promoted after the company's first commanding officer, Capt. George T. Simonson, became the 80th's Major (third in command of the regiment). All these changes happened within days of each other, in the midst of the 80th's feverish preparations to prematurely leave training camp and rush to Kentucky to help repulse the Confederate invasion of that state. From September through December 1862 Lieut. Kimball was listed as "Present" with the 80th. During that time the regiment took part in the bloody fighting at Perryville in Boyle County, Kentucky. This was just 30 days after the regiment had first drawn its uniforms and weapons. During 2 hours of heavy fighting the 80th lost 25 men killed, 116 wounded, and 16 captured out of the 738 men it took into the battle. This was a 27% casualty rate, and amounted to 45% of all casualties the regiment would suffer during its entire service. In Lieut. Kimball's service records is a hand-written letter dated February 9, 1863 from Elizabethtowne, Kentucky in which he wrote "I hereby tender my resignation to take effect immediately and unconditionally" giving as his reason that "...my health is such that it renders me unfit for military duty." With the letter is a hand-written certificate by the 80th's Surgeon, George B. Jaquess, also dated February 9th from Elizabethtowne. In it he states that Lieut. Kimball was "laboring under Chronic Bronchitis of long standing." Surg. Jaquess added that Kimball had "never been able for military duty, except at intervals since he entered the service" and specifically "has not been on duty for the last ninety days in consequence of said disability." Lieut. Kimball's resignation was accepted by the Army on February 16, 1863 and he was honorably discharged from the military effective that date. His position was subsequently filled by promoting 3rd Sergt. Henry C. Jerauld of Co. A. For more about Lieut. Kimball's experiences during the war, click the 80th History link below to read what happened during for the months he was present with the unit. If you have additional details about him that you would be willing to share, then please contact Scott C. Meeker using the link below. Sources: Civil War Compiled Military Service Records by Office of Adjutant General of the United States (Washington, DC) and Regimental Descriptive Rolls, 1861-1865, Volumes III, IV, and VIII, Report of the Adjutant General of the State of Indiana (Indianapolis, Indiana, 1866). All Rights Reserved. Created November 20, 2004. Last updated December 16, 2004.